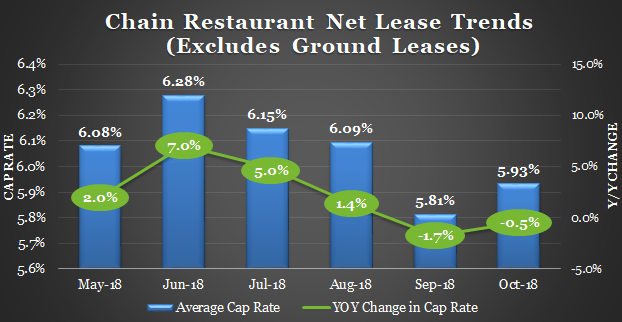 With 78% of public chains having reported so far, 3Q comp growth for the $1B+ chains looks to be slightly below initial expectations but still above average with casual stronger than QSR this time around. 3Q government data indicates a slow-down in Total Food Service sales in September (+5.8% according to advance estimate) after very strong growth in July (+9.4%) and August (+10.8%). 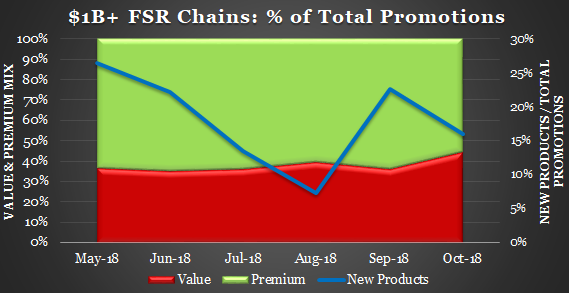 Promotional composition for the $1B+ chains flip flopped from last month with FSR accelerating value offers (value mix reached an LTM high of 44% vs. 36% last month) as QSR eased (with the mix of value offers pulling back from a September LTM high of 61% to 54% currently which is more in-line with the recent average). 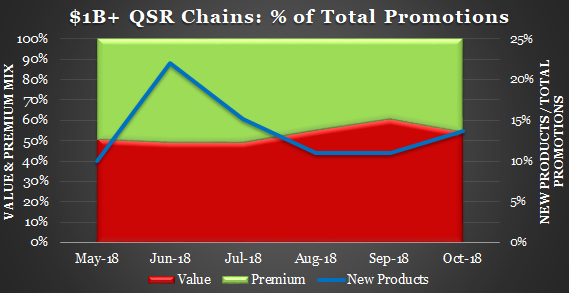 The QSR sandwich sub-segment is at 46% which is notably less than 56% for the casual FSR sub-segment. $5 to $6 offers represent the greatest share of price point promotions for both QSR & FSR as both segments converge around value. 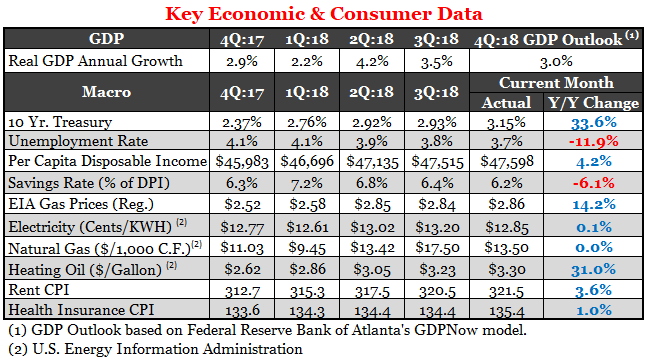 Preliminary 3Q GDP growth came in below initial expectations at +3.5% (versus +4.1% forecast last month) and is now expected to slow further to +3.0% in 4Q, but still represents solid economic growth. Pros: increasing disposable income; record low unemployment rate; strong consumer confidence (October reading was another record); and lower tax rates for 2018. Cons: Higher gas prices (should start to moderate in-line with falling oil prices) and rising interest rates. Commodity costs were mostly favorable in October with the BLS Foodstuffs Index falling -2.4% and chicken at an LTM low. 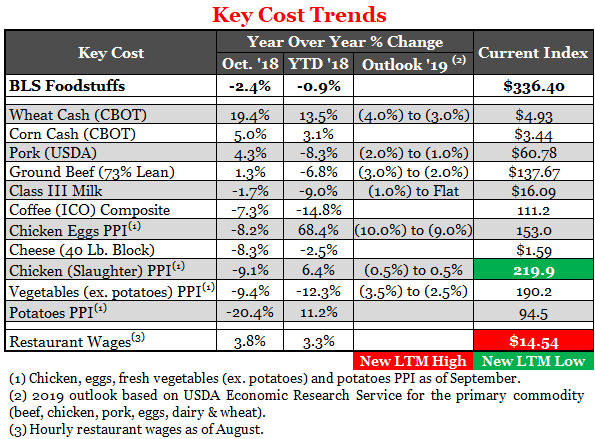 2019 USDA outlook is favorable with a big improvement in October's cost outlook for eggs (down 9% to 10%). 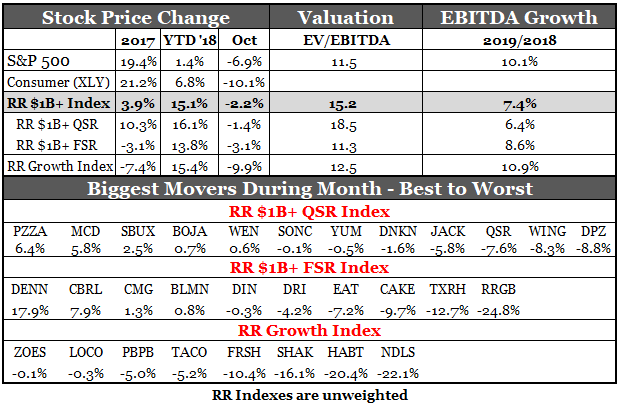 October survey shows a further deterioration in franchisee EBITDA valuations due to margin pressure driven by rising labor costs, creeping interest rates and increased supply. According to survey participants, Applebee's & Arby's multiples are trending higher while Denny's & Burger King's valuations remain strong. 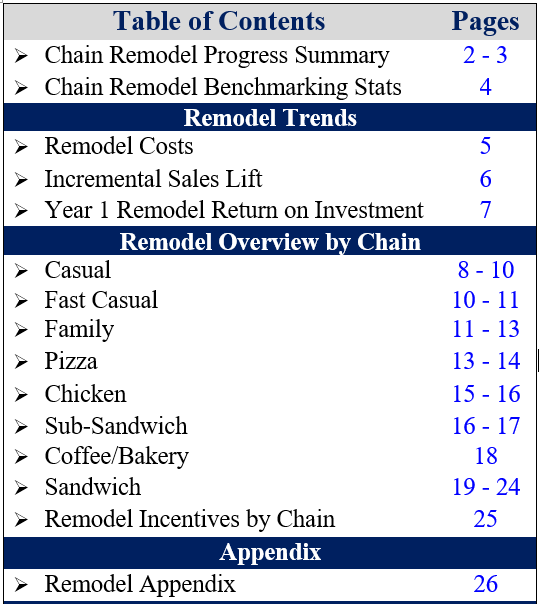 Popeyes is trending down due to more aggressive development requirements tied to acquisitions. RR's $1B+ Index outperformed the broader market which sold off sharply in October. Notably, the RR Index is up +15% YTD vs. just +1.4% for the S&P 500. 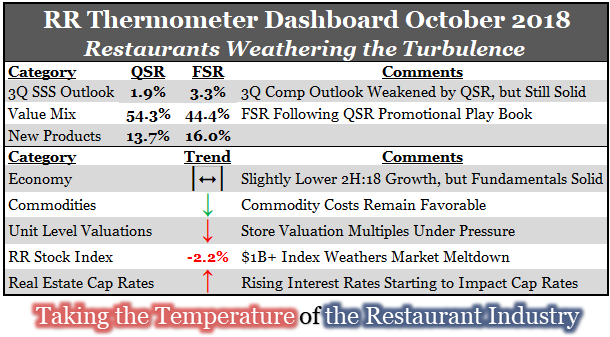 Smaller, higher growth restaurant stocks declined double digits during the month in an apparent flight to quality. Cap rates ticked-up in October as rising interest rates are starting to weigh on commercial real estate valuations.